Above: A series of graphics released by the New York City Housing Authority (NYCHA) in the 30’s and 40’s with the onset of public housing construction. When the United States’ first public housing was built in 1935 in New York City, the initiative marked the beginning of the end of New York’s rampant slums. Mayor Fiorello La Guardia, who himself had lost his wife to tuberculosis attributable to poor housing, had joined Louis H. Pink (of the eponymous Pinks housing project in Brooklyn), who was Chairman of the State Board of Housing, to create the New York City Housing Authority (NYCHA). The overcrowded, poorly ventilated, unsanitary, and crime-ridden NYC slums would be swept away by a grand effort of publicly funded, thoughtfully planned living complexes that would bring dignity and well-being to New York’s working classes. 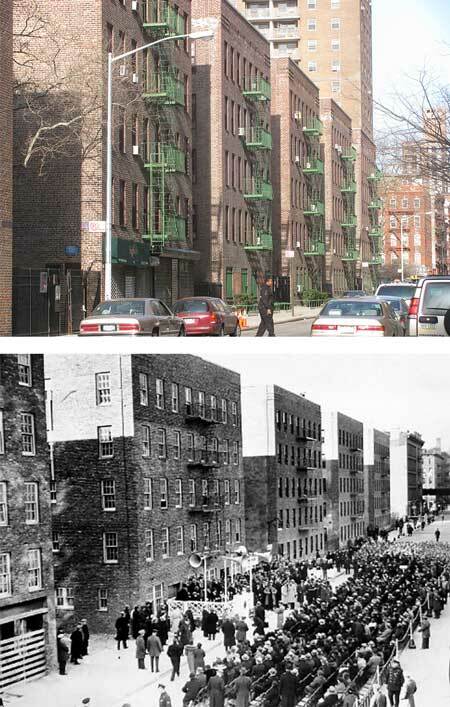 Yet today, nearly a century later, the projects are arguably the closest thing New York has to the slums of its past (or of developing countries). There are all the familiar symptoms: overcrowding, poverty, crime, and poor health. Long a subject of debate and concern for New Yorkers, public housing has recently made its way further into the spotlight with the increasingly rapid gentrification throughout the city’s five boroughs, but more importantly, NYCHA’s alarming recent financial crisis. 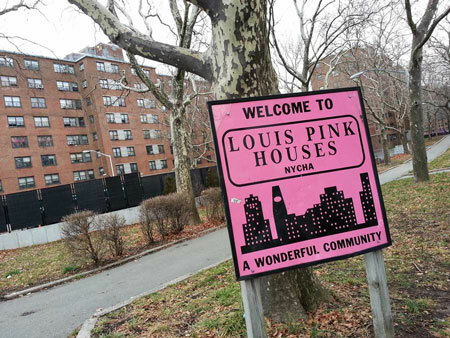 The now infamous Pink Houses in Brooklyn, built in 1959 and named after Louis H. Pink, who helped create the New York City Housing Authority (NYCHA). 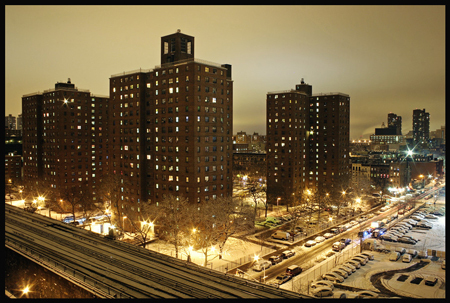 Like most public housing to this day, New York’s projects were built in what is known as the tower-in-the-park style, an adaptation of the housing complexes described in Le Corbusier’s Ville Contemporaine, or Contemporary City. Notwithstanding for a moment the many criticisms about the paternalism or megalomania of one man thinking he might resolve socioeconomic disparities with a few pages of design, the Ville Contemporaine was a nice idea: green spaces for everyone, big roadways where all classes drove and strove together, and even cleverly L-shaped apartments that came together tetris-style to ensure that every unit had light shining throughout their apartment at all hours of the daytime. The bottom line was that a way needed to be found to provide dignity and well-being to the city’s poor, and cheaply, particularly with the onset of urbanization. That’s more than we can say for the vast majority of development today. 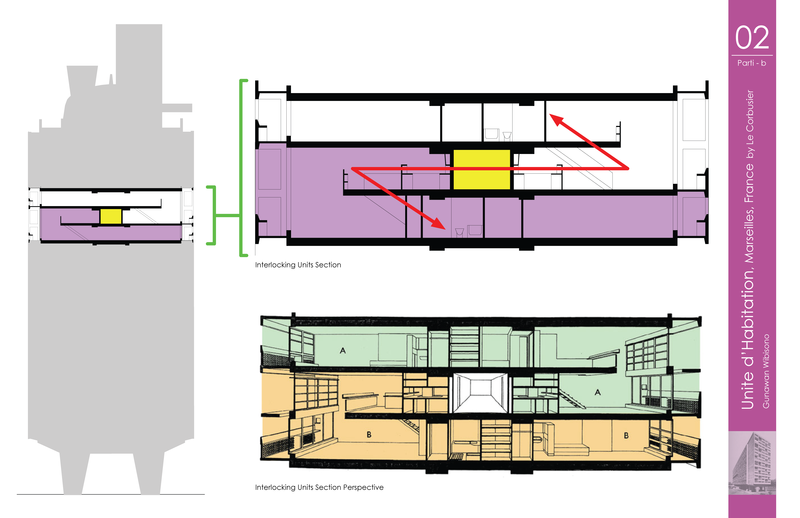 And while public housing in NYC lacks most of the flourishes of Le Corbusier’s original plans, they were a groundbreaking improvement from the slums they replaced: a fact that many today forget when they rail public housing’s inhumanity. So what happened? How did they get to where they are today? The First Houses: The United States’ first public housing, built in 1935 and still in existence on 3rd Street and Avenue A. To start, not all proponents of public housing intended it to house the city’s poorest, but rather select segments of the working class, particularly the middle class that had been temporarily disenfranchised by the Great Depression. After World War II, a series of benefits and low-interest mortgages were targeted to white people living in public housing, allowing them to move out, but leaving an impoverished and predominantly minority population. This issue was part of a broader, growing debate over who public housing should serve. Tenant screening and tenant policies were enacted in different ways, with some pushing for residents to be traditionally ‘bonafide’ citizens, employed, and could prove their commitment to self-improvement, while others felt the housing should serve those who were most marginalized and powerless. This debate materialized in a particularly muddled way through the introduction of income limits and maximum rents in the 40’s and 50’s: essentially, residents could be evicted if their income surpassed a certain level, only to face the disproportionately more expensive private housing market (public housing rents were required to be 20% less than the lowest market rates). This was enacted mainly so as not to threaten the private sector, who saw public housing as a danger and preferred that it remain focused on the poorest, who could not afford private housing anyway. This aspect, along with the housing authorities’ insistence that the projects be segregated, and compounded by racial minorities’ pre-existing challenges to upward mobility, created cycles of poverty. Another source of contention for public housing in the United States as a whole, and arguably the most important, has been its financing. From the very start, the limited rent income could not keep up with maintenance and repairs, even with federal funding. As repair and maintenance costs increased with aging buildings, federal support was also decreasing: public housing was seen as a failed experiment and a symbol of urban decay. In the 60’s and on into the 80’s, the private sector was sought as an alternative through the public financing of private subsidized housing developments, but this unfortunately led to widespread embezzlement of public funds and corrupt practices that caused extensive building disrepair, mortgage defaults, foreclosures, and even entire blocks of vacant, boarded-up housing. For many cities across the U.S. such as Chicago and St. Louis, public housing projects were shut down. The majority of NYC’s public housing is located in Manhattan, Brooklyn and the Bronx, each with around 100 developments and 50,000+ apartments. Staten Island and Queens have 10 and 22 developments, respectively. Even so, New York’s public housing carried on with relative success: today, NYCHA still houses over 400,000 New Yorkers, with an average household income of $22,000 and an average gross rent of $436. This is in a city with a median income of $50,000 and an average rent of around $3800. A quarter of a million more are on the waiting list to get in. And yet with city and state funding decreasing drastically particularly in the last decade, NYCHA now has a $77 million budget deficit, and needs $18 billion in upgrades and repairs. The conditions of the houses have been long overlooked, and a recent class-action lawsuit found NYCHA responsible for rampant mold and moisture problems that were directly impacting residents’ health. All of this is occurring along with some of the most rapid gentrification in New York City’s history, a new form of ‘hyper-gentrification’ as some are calling it. Many of the projects now lie on some of the city’s most prime real estate. This has led to increasing demand for privatizing some of the projects’ units, either by leasing or even selling, which proponents say could give NYCHA much needed income. Even the wide open courts and promenades that are typical of project housing are now being considered as a potential space for private development. On the other hand, champions of public housing state that the projects are an institution that is at the heart of New York City’s culture, and that substantial state and/or city funding needs to be reinstated, citing as comparison the hundreds of millions of dollars invested in baseball stadiums by both the state and city. A compromise could lie in the growing trend of mixed-income housing, with many large private developments now being required to include low-income housing. This could allow current public housing to open some of its units for sale or at market-rate rents. The difficulty in this is ensuring that the rate of privatization matches the amount of new public housing being made available. And even so, the recent controversy of ‘poor doors’ serves as a reminder that there won’t be any easy solution, for the very same reasons that the projects exist in their state today. The fact is that a large and defining faction of New Yorkers is dependent on public housing, and to repeatedly and progressively merely push them farther out does not seem like a smart solution. ©2018 ARCHIVE Global. All Rights Reserved. ARCHIVE Global is a tax-exempt 501(c)(3) public charity in the United States.